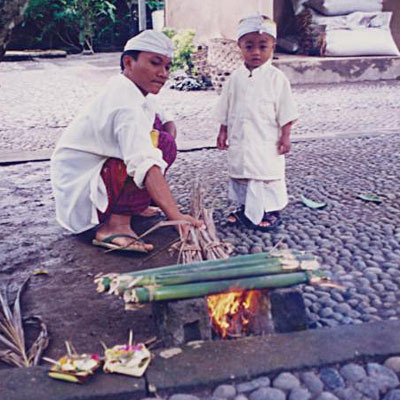 Some impressions of daily life in Bali by Peter Hinze. 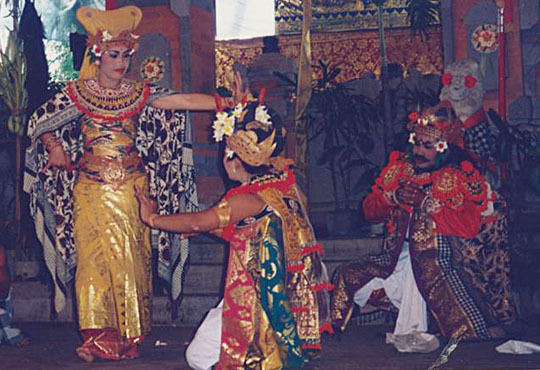 See also Peter Hinze’s My Favourite Planet guide to Bali (in German). 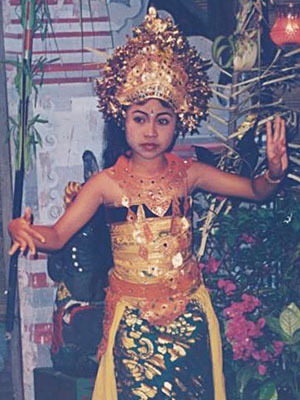 Around 93% of Balinese people are Hindus, which makes it the only majority Hindu population beyond the Indian sub-continent and the only Hindu province in the mainly Muslim Indonesian archipelago. 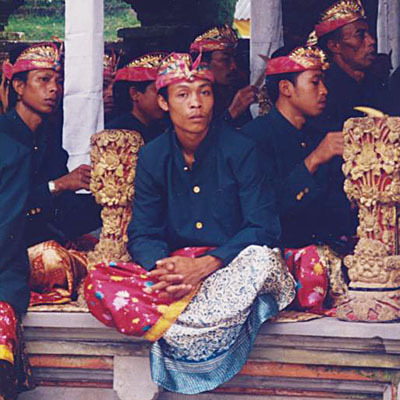 There are around 20,000 temples (puras) and shrines on the island, and each village has at least three (Pura Puseh, Pura Desa and Pura Dalem). 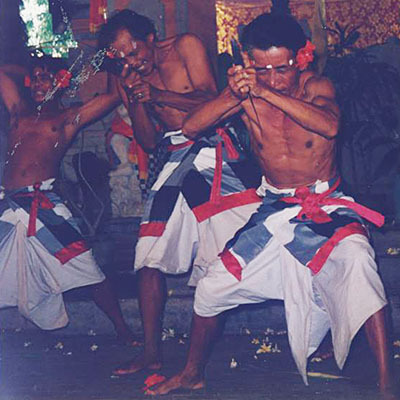 Most temples are open to visitors, often for a small entrance fee, and at many you are required to wear a sarong. 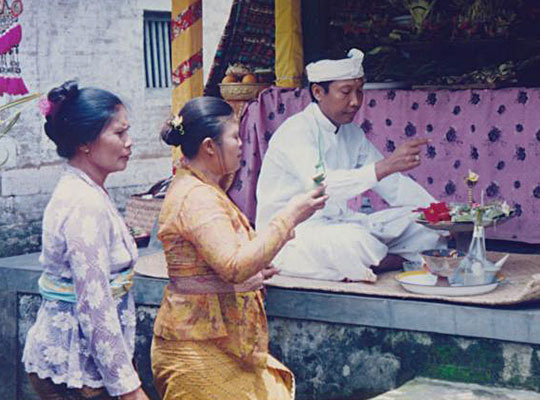 These can often be hired outside the temple, however it is more economical to buy a sarong from a market on your arrival in Bali, especially if you intend to visit several temples. 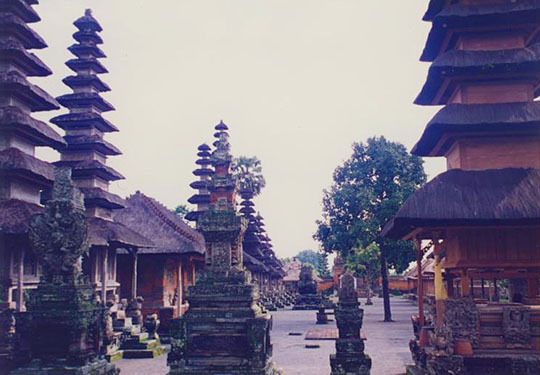 Pura Taman Ayun was built in 1634 by Prince I Gusti Agung Anon Putra-Raja when Mengwi was the capital of an influential princedom. 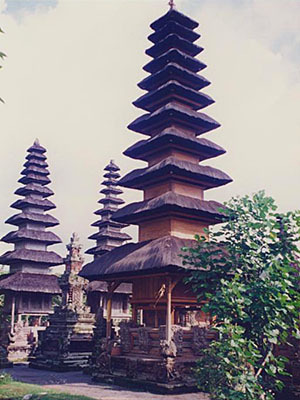 It is the second largest temple complex on Bali, surrounded by a large well-kept park planted with fruit trees and flowers. 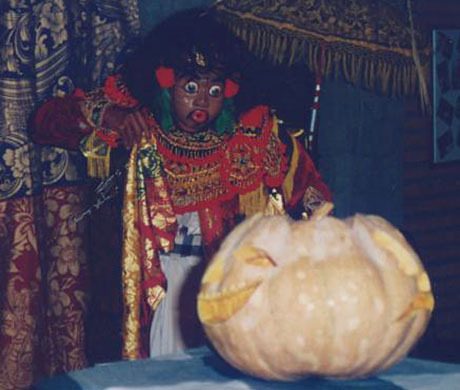 The inner sanctum may only be entered by believers. Visitors, however, can still get a good view over the low perimeter wall of the ten meru, four of which have 11 storeys. 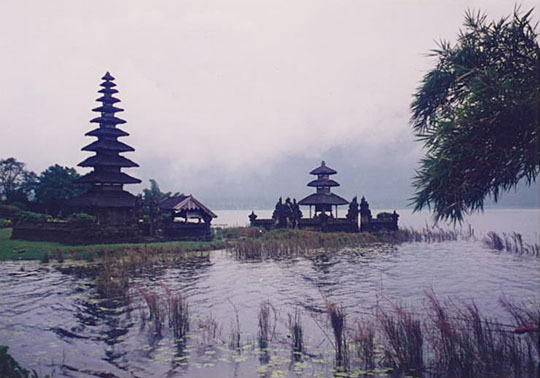 on the west bank of Lake Bratan. 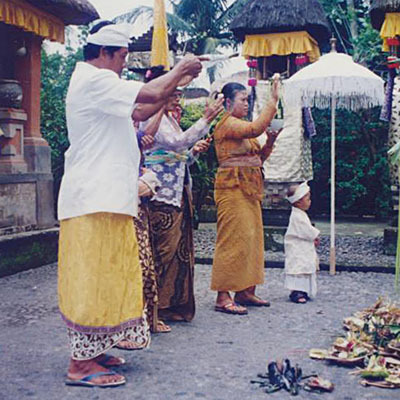 The goddess Dewi Danu is the patron of the rice farmers who take water blessed by the priests to pour on their rice fields in pious hope of a good harvest. 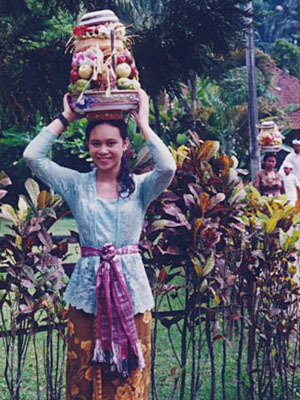 A worshipper carries her sacrifice of fruit to the temple. 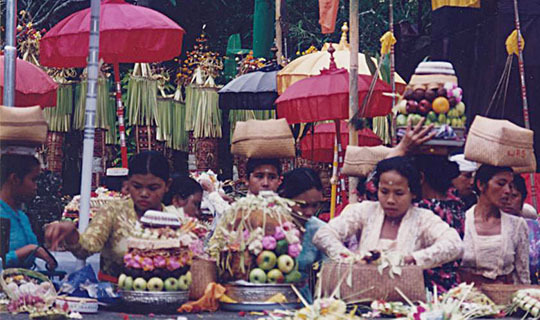 Worshippers lay their sacrifices of fruit on the temple altar. 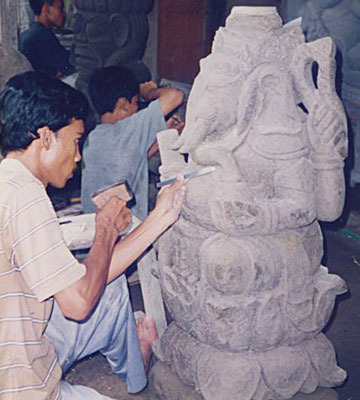 sculpture of the elephant-headed-god Ganesh. 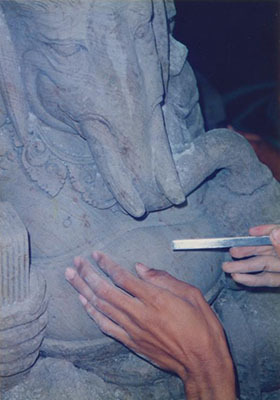 Ganesh's stomach gets some special attention. 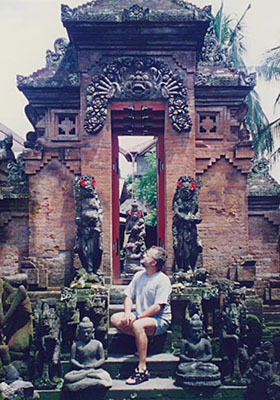 Peter Hinze admires the work of Balinese stonemasons. 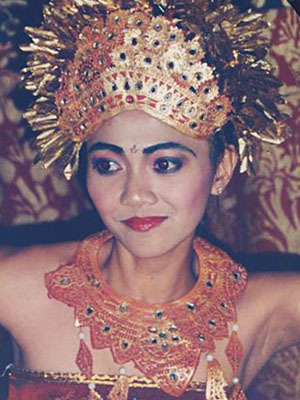 There are over 200 types of dance in Bali, of which around 60 are still performed. 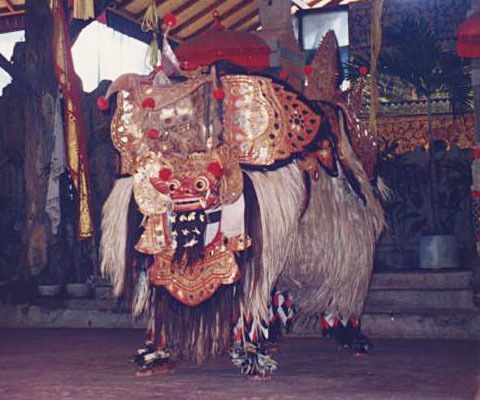 The Barong dance relates the story of the mythological Balinese spirit king hero Barong. 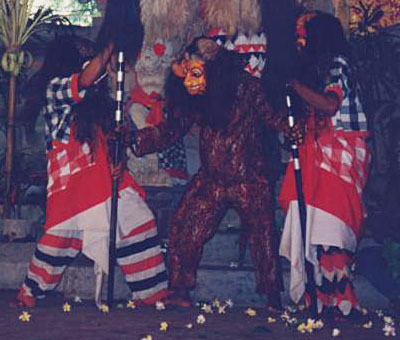 Accompanied by the lion spirit protector Banas Pati Rajah, he combats the evil magic of Rangda. 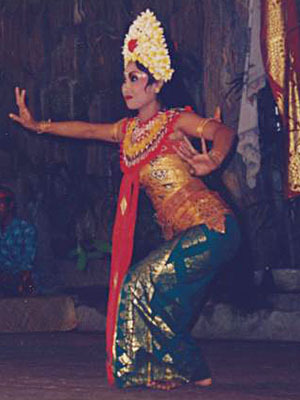 This dance drama, now mostly performed for tourists, was once performed as part of the Calonarang dance procession through Bali's streets. 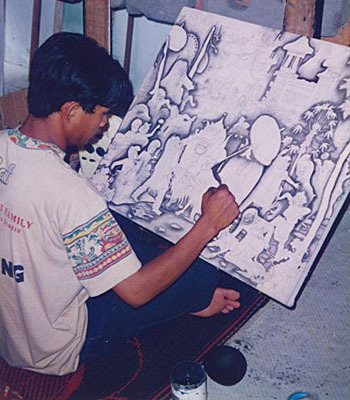 Balinese artist paints a traditional scene. 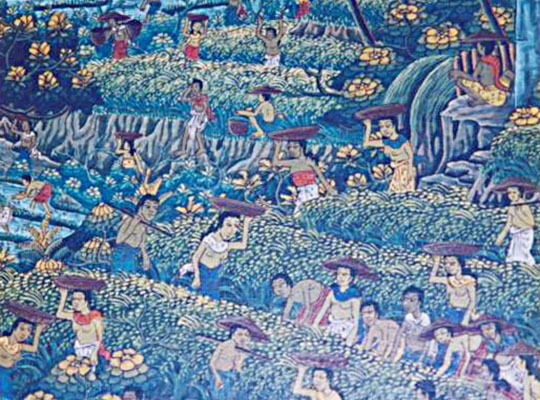 Balinese painting of a harvest (detail). 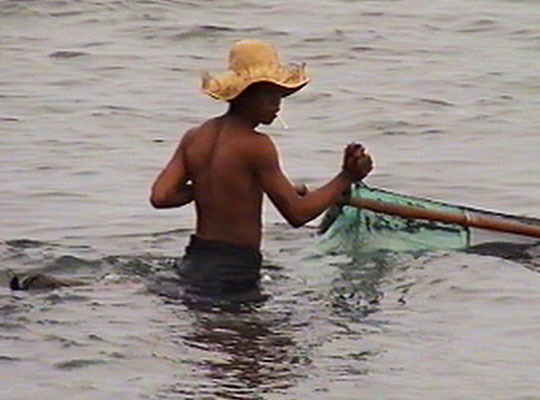 Balinese fisherman pulls in his net. yellow-breasted macaw, blue macaw) in Taman Burung Bali Bird Park. 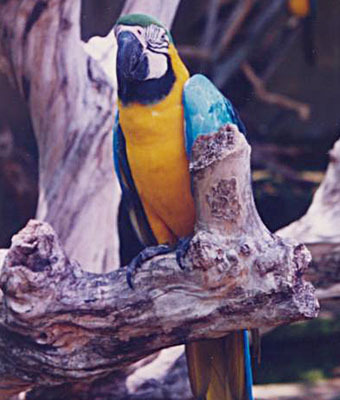 This parrot species is common throughout the forests of South America (including Venezuela, Brazil, Bolivia, Paraguay) although it is endangered in Trinidad and Panama. 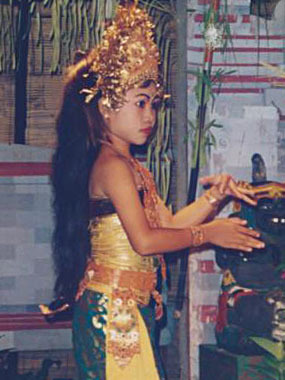 the bar-pouched wreathed hornbill) in Taman Burung Bali Bird Park. 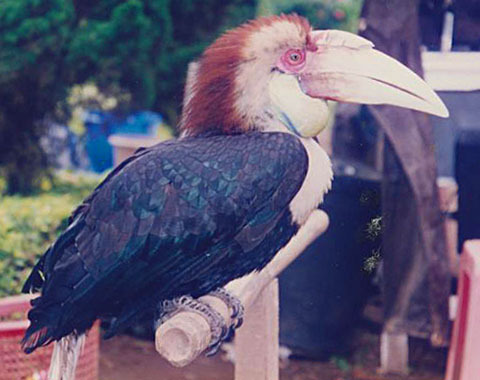 Closely related to the plain-pouched hornbill, these large forest birds, 75–100 cm (30–40 inches) long are widespread across Asia, from Bhutan and India to southeast Asia and the Greater Sundas. 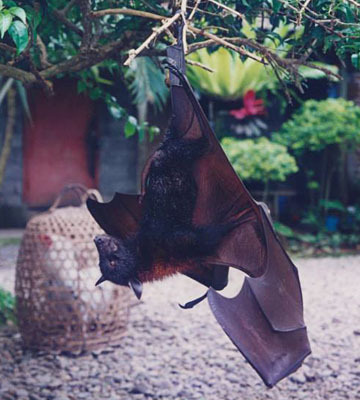 This chap is from Borneo. 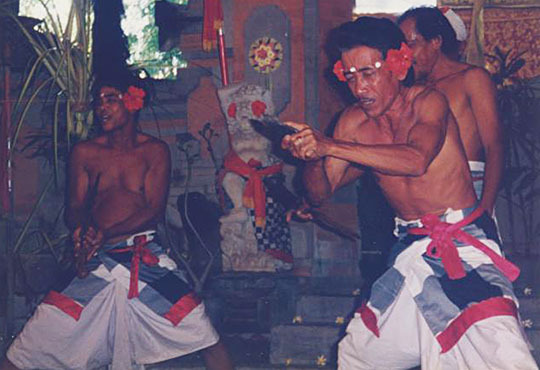 The Bali Bird Park has examples of almost every species of hornbill as part of an enormous collection of around 1000 birds of 250 different species from all over the world, including some of the rarest and most exotic. 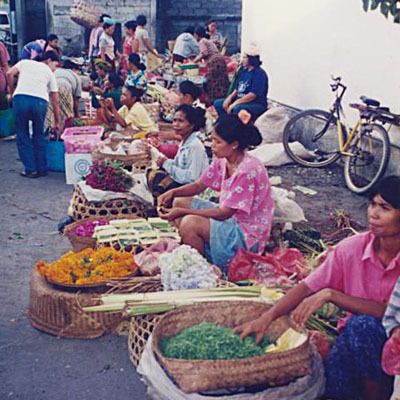 As well as providing a fascinating spectacle for tourists, the park also runs breeding, research and educational programmes aimed at preserving endangered bird species. 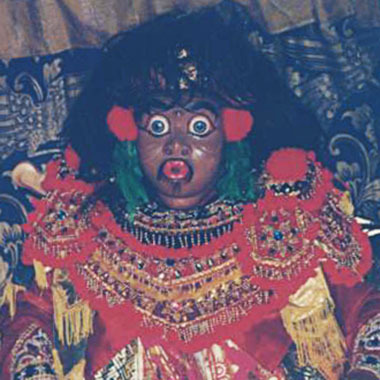 and all other blogs on My Favourite Planet.